Ted Cruz attack on Trump over letting people die in the streets. 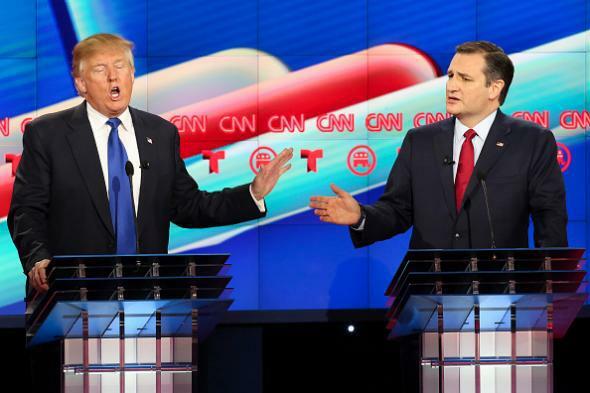 Donald Trump and Ted Cruz at Thursday’s Republican debate in Houston. CRUZ: Did you say, if you want people to die on the streets if you don’t support socialized health care, you have no heart. TRUMP: Correct. I will not let people die on the streets—let me talk. CRUZ: Explain your plan, please. What’s illustrative about this exchange is that Cruz keeps implying that no private insurance or health care provider wants to take care of someone with so little money that they’re otherwise about to expire on the street. Which is probably true! It does seem unfair to demand that a private, for-profit business in a competitive market spend its resources on customers who will not be able to pay for the services they’re receiving. Which is why most Americans generally support the idea that the government should step in to cover costs in these kinds of situations—that there are things in life (health care, school, being able to retire before you fall over at the assembly line and die) that every person in a prosperous society should have access to regardless of their individual level of wealth. But this is the primary of a Republican Party that’s been getting more and more extreme for decades to the point that the idea of the government doing anything besides building tanks is considered rank communist treason. And thus it seems almost natural, in this paradigm, for a candidate to think he’s really nailed his opponent by pointing out that he doesn’t want to let sick people pass out and die on the sidewalk because they can’t afford their hospital bills.